If you would like more information before booking your stay with us, please phone or fill in the contact form below. From Aldergrove Airport – Journey time 1hour by car: On Exiting Aldergrove Airport follow the signs for Antrim. Take the A26 road heading north towards Ballymena then take the A42 road directly to Carnlough. On reaching Carnlough, drive through the village past the harbour for approximately 1/4 of a mile. Take the slip road on left (i.e. Branch Road) to junction with the Largy Road. To contact us call at the first bungalow, on the left hand side past the junction, which is our home. Largy Coastal Apartments are another 100 yards past our home on the right hand side. From Larne Harbour – Journey time 30 minutes by car: On Exiting Larne Harbour, take the dual carriage way. After the second roundabout move over into the right hand lane. Take the A2 coast road to Glenarm and follow the directions below. From Belfast Harbour – Journey time 1 hour by car: Driving from Belfast, take the A8 road to Larne. Coming into Larne town keep to the right hand lane on the dual carriage way going towards the Harbour. Drive past the tall flats and then take the first road on the left of dual carriage way. At the roundabout take the A2 coast road to Glenarm. On reaching Glenarm village turn right over the river past the Church and continue on A2 coast road for another 3 miles. 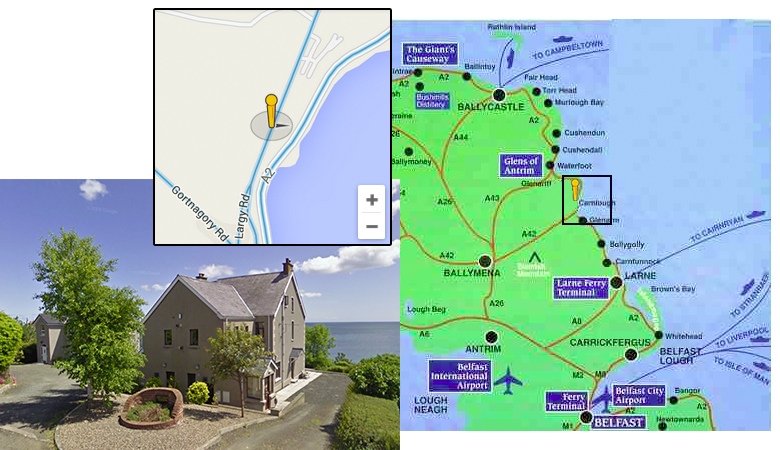 On reaching Carnlough village, drive past the harbour for approximately 1/4 of a mile. Take the slip road on left (i.e. Branch Road) to junction with the Largy Road. The first bungalow on the left past the junction is our home. Largy Coastal Apartments are another 100 yards on the right hand side. Exploring the Causeway Coast? 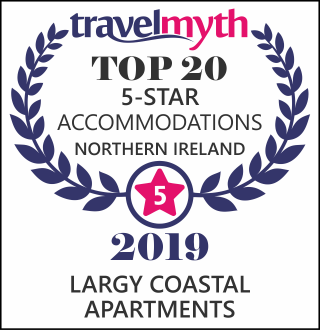 Stay in Carnlough at Largy Coastal Apartments. Thank you both very much for letting us rent your holiday apartment last week, my mother and I thoroughly enjoyed our stay. It was a ‘home from home’ and everything was catered for. As I have said, the internet photo’s do not do the place justice. We will definitely be back to stay. ‘7 Night’ lets commence on a Saturday, however we will be pleased to accommodate you on any 7 night period of you choice, depending on availability. Additional nights can be facilitated, depending on availability. 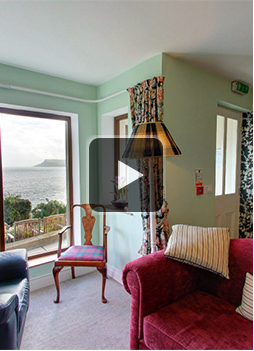 ‘Weekend Breaks’ are for 2 nights accommodation, either Friday/Saturday or Saturday/Sunday, depending on availability. ‘Midweek Breaks’ are for 3 nights accommodation, either Monday/Tuesday/Wednesday or Tuesday/Wednesday/ Thursday, depending on availability. Your apartment will be available for occupation from 4pm on day of arrival and must be vacated by 10am on day of departure.